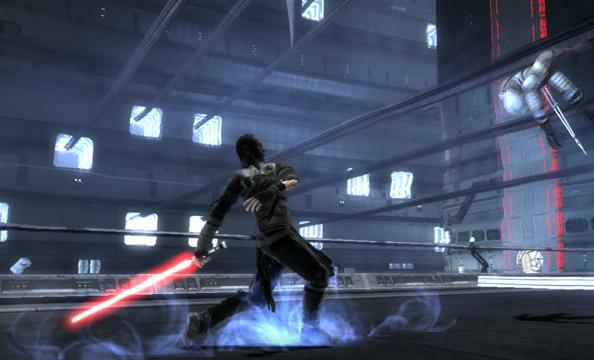 The demo for Star Wars: Force Unleashed is available. And I don’t care which system you try it for, but you must download this demo! Even if you hate Star Wars. Especially if you love Star Wars. I told a few friends last night: this game is better than Episodes 1-3 combined, and I’ve only tried the demo! But this demo has sold me on the game already. The trouble with that is, I’m hoping it’s not like the old Jedi Academy games, where you have to build up to those powers. I just want to jump in to the game doing what I was doing in this demo! Smashing small objects into big objects to create more small objects to throw at people? Awesome! I tested out the Xbox 360 version, but will look into getting the PS3 version soon. I hear that was the preferred platform for developing the game, in house at LucasArts. Maybe it will show! I also still wish the Wii had a demo-system in place. Just watching the videos for this game on the Wii makes me want to try it. Sure it might be graphically slightly less stunning, but the controls look like rediculous fun. In a few instances on the Xbox 360 version, the controls bugged me, but all in all the game was a blast. Sounds were good, graphics were very pleasing, the only thing I didn’t like was a noticibly not James Earl Jones Darth Vader. It was a nice try, but it certainly left something to be desired, in this era of star-studded casts doing video game voice overs. So, I’m sure you’ve all already made up your mind, but I’m telling you, if you haven’t, I don’t care what system it’s for, get the demo. The game will launch on the Xbox 360, PS2, PS3, PSP, Wii, and Nintendo DS – come to think if it, there could possibly be a DS demo on the Nintendo Channel (if you’ve got a Wii & a DS). It’s been a long time since my last news post, and that’s partly because I have been busy with work, while also working on a side-project which should come to light before too long (I’ve already put money in to it, so I hope I don’t let it all go to waste!). Also will be out of town the next two weekends in a row, so I just wnted everyone to know the site lives, it’s just… in a slump. You’re used to it, though. Crash Course renamed: now a mouthfull. Rockers don't use no plastic!